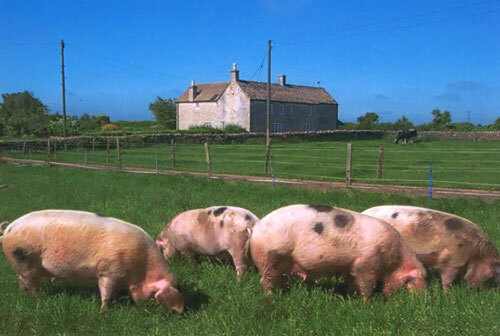 The first Landrace pigs were imported into Britain from Sweden in 1949 (4 boars and 8 gilts) with other imports to follow from 1953 onwards, these came into Northern Ireland, the Isle of Man and the Channel Islands. The British Landrace Pig Society was formed to create a herd book for the first offspring born 1950, from the 1949 importation, and an evaluation scheme was created, with the first Pig Testing Scheme for daily gain and fat depths, a testing station was built at Stockton-on-Forest, York. This was a first example of pig testing in the UK, and a testament to the foresight of the founder members of the Society, as to the future needs in commercial and pedigree pig production. With an eye on the development of the pedigree pig industry and the need for a national herd book for all breeds, the British Landrace Pig Society joined forces with NPBA now the British Pig Association in 1978. New bloodlines were imported into England, Scotland and Northern Ireland from Norway in the 1980s and some new bloodlines into Northern Ireland from Finland and more recently from Norway. These new lines were imported, and assessed, and used to broaden the genetic base of the breed, allowing development, and making the British Landrace pig unique amongst other Landrace breeds throughout the world. The British Landrace breed has expanded rapidly to occupy its present position as one of the UK’s most popular breeds of pig. With Landrace breeders being acutely aware of the need to improve commercial attributes of the breed, carrying on from the 1950s, with testing and selection right up to present days, keeping up with the demands of the ever changing world of commercial/pedigree pig production. The British Landrace is a very versatile breed, performing well under either indoor or outdoor systems of management. Sows have the ability to produce and rear large litters of piglets with very good daily gain and high lean meat content, in a superbly fleshed carcase, which is ideal for either fresh pork or bacon production. The greatest strength of the Landrace is its undisputed ability to improve other breeds of pig when crossed to produce hybrid gilts – over 90% of hybrid gilt production in Western Europe and North America uses Landrace bloodlines as the foundation for the profitable production of quality pigmeat.